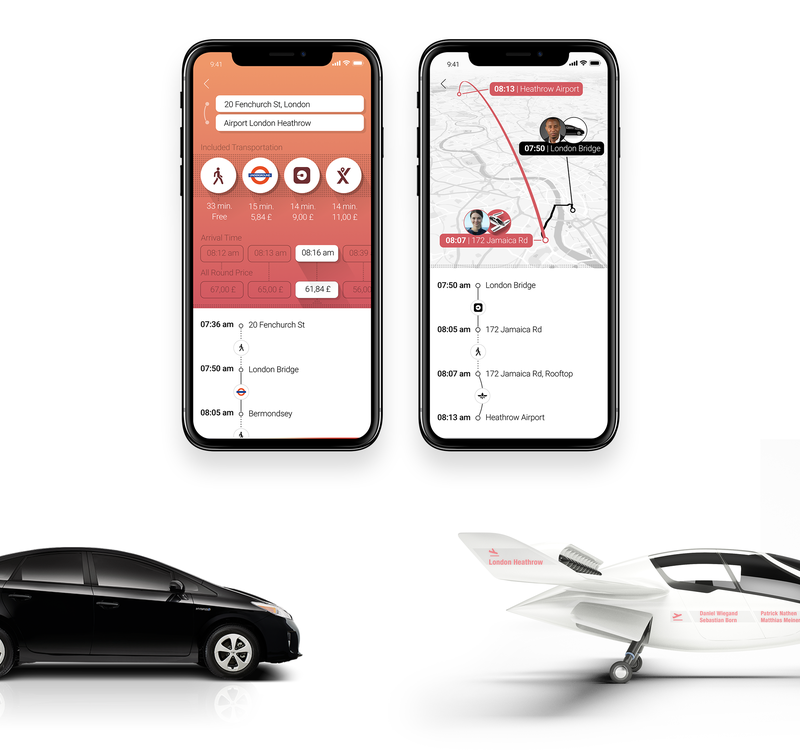 Lilium compares air taxis with conventional taxis based on travel time and travel costs. At a first glance, the air taxi impresses with quickness combined with reasonable travel costs. However, a journey’s beginning and end are rarely the landing pad. Other means of transport will be necessary in many instances to arrive at one’s final destination. Additional travel times and costs must thus be taken into account. Taking a conventional taxi might therefore outdo the air taxi in terms of comfort and speed due to the necessity to change transport means. The planning effort for a journey ranges from simple commuting between two landing pads to intercontinental travel with different means of transport. A commuter flying the same route daily has different expectations and needs than a traveler in an unfamiliar city. Thus, it is required to master the right balance between these two needs: for fast booking as well as for an embedded service covering the entire journey. Travelers, who are unfamiliar with an area, need to be offered the fastest, most convenient and cheapest way to the closest landing pad. Ideally, the fare will include both booking and navigation to the start and from the end point. Each traveler values price, time and effort differently based on his individual needs. Price conscious passengers may tolerate stopovers and waiting for other passengers. Whereas other passengers want to move from A to B as quickly as possible and value time over money. It is essential to design attractive solutions for a large proportion of commuters to ensure a competitive advantage compared to taxi, bus and train. When ordering an Uber to get to the airport, one knows that two large suitcases can be accommodated at no extra charge. In an air taxi, the available space and freight weight is limited. Extra costs due to additional bookings or limitations might shrink the air taxi’s attractiveness and adds complexity to the booking process. It is yet to be determined to what extent flying operations will be possible in a snowstorm or fog. In the case of flight cancellations, the passenger should be given an unbureaucratic alternative. The denser the network of landing sites, the more attractive it becomes to use an air taxi. It would be desirable to have service personnel on each landing pad. However, this is financially unfeasible. The interaction with passengers for instructions, assistance and safety must therefore be by human-machine interaction. This requires sophisticated concepts. In future, the requirements will continue to rise with the introduction of autonomous jets. Passengers most urgently need taxis at night, when public transport is not available. Most of the air taxi’s landing pads will be located on the roofs of buildings, which might be difficult to access at night and at weekends. It is important to ensure access at any time of the day. 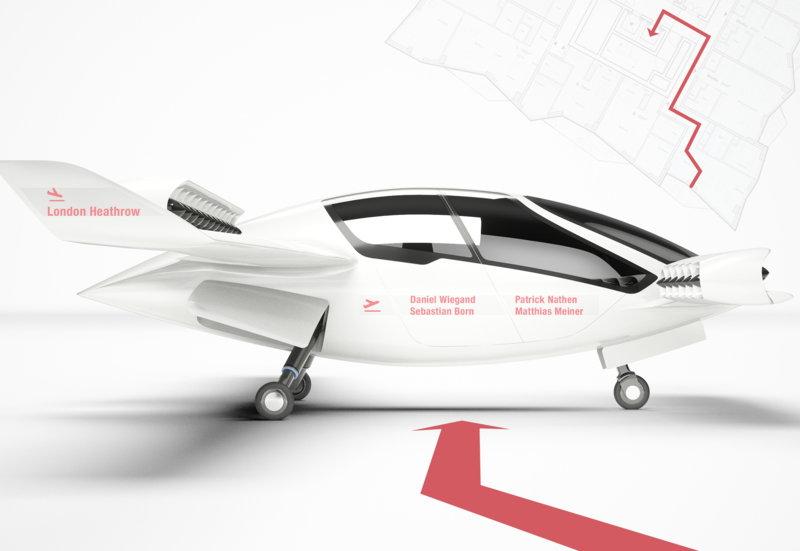 Lilium advertises flights from London to Paris within an hour. By 2020, the UK will be no longer part of the EU, and entry will therefore be associated with visa inspections. Yet, it is not feasible to equip every landing pad with customs infrastructure. Therefore Lilium will have to develop creative solutions in order to allow trans-national flights with visa controls. Rush hour scenarios need flexible solutions. For instance, providing onward air transportation for 853 passengers of an A380 that has just landed presents a number of challenges and requires thorough planning to structure the flow of passengers. Most passengers want to continue their journey as quickly as possible, all at the same time, yet to a variety of destinations. These are the challenges to be solved: How are the waiting lines organized to prevent passengers from wandering around on the landing pad? Who has booked which air taxi and what responses are necessary to manage delayed passengers while other passengers are already standing in line? The landing pads require thorough management too. At such highly frequented pads, how do airborne air taxis line up in the most efficient way when all landing points are taken for boarding? May aircraft batteries be charged in such situations in a time-consuming manner or must their batteries be fully loaded before approaching a landing pad? A mere recharging infrastructure is not effective. What is required is a sophisticated charge management concept. Not all landing sites have power connections or are used exclusively by Lilium jets. Recharging and billing must be straightforward. In addition, charge management has to be an integral part of fleet and route management, as it has to be efficiently coordinated when and where each jet has to be recharged. Getting to the rooftop landing pad in an unfamiliar building can be quite complicated. A straight forward orientation and navigation concept is thus needed. It starts with finding the right building entrance and ends with the correct seat. Furthermore, are the passengers leaving the waiting area as soon as the air taxi is approaching or only after landing? In addition, appropriate means must be in place which enables the passenger to accurately identify his air taxi amongst several others on the landing field. It is essential to simplify the navigation from street to the jet substantially to best maintain the attractiveness of the service. Security checks are a serious business risk because they are personnel intensive, costly and, above all, time consuming for the passenger. It is difficult to calculate which measures are necessary in which region as they may be subject to change after an attack. Basically, security measures have a negative impact on the user experience. In the worst case, it is not possible to start from all pads because the necessary infrastructure for security checks is unavailable. Without an extensive network of public landing pads air taxis will be impractical. 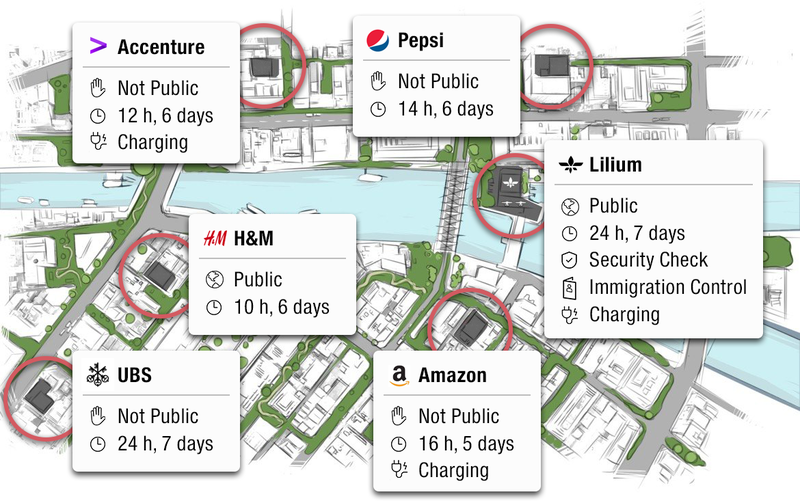 The current information on the company website states that Lilium is planning to operate a few landing pads themselves while encouraging private real estate investors to build additional landing pads to increase the attractiveness of their real estate. However, this plan might be difficult to realize as it can be assumed that constructing landing pads might predominantly serve private interests. 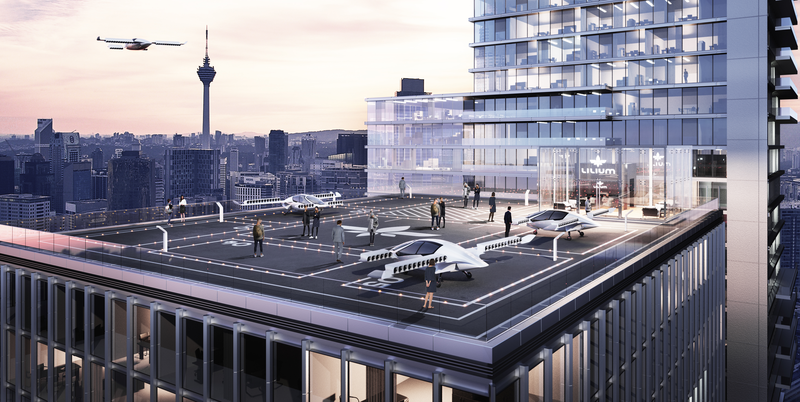 Companies such as Siemens might have the wish to give their employees access to air taxis. However, it is likely that landing pads provided by private companies might not be open to the public as the companies have no interest in granting third parties access to their premises. There may be an extensive network of landing pads at some point, but not all of them will be accessible to the public. Additional incentives will have to be created to encourage the construction of public landing pads. Ideally, the pilots will receive information about their passengers via the interface in the cockpit which enables them to perform check-in and check-out. Important information includes destination, names of passengers, luggage and any delay times of missing passengers. From cleaners to service personnel, employees have rights and responsibilities that must be guaranteed. A pilot, for example, has the duty to start his shift at 05:30 with the jet X from landing pad Y. It must be ensured that the pilot is assigned a jet near his home and has access to the building and the jet. In addition, the pilot must then unlock the jet, authenticate himself, launch the jet and receive instructions for the first flight, including loading instructions. For the navigation of an on-demand air taxi, cockpits must be designed to meet a new set of needs. The flight route, as well as stopovers and recharging stops must be visually displayed for the pilot. Difficulties such as occupied landing pads and a lack of recharging infrastructure must be communicated. In addition, the transition to autonomization will require additional interfaces in and around the jet to handle communication with passengers. It is required to monitor the whereabouts and crew of each jet. In addition, the exact status must be reported, comprising data such as the remaining range and the technical condition of individual components. The aircraft history must also be available via an application. For instance, it has to be precisely documented who had carried out which maintenance. 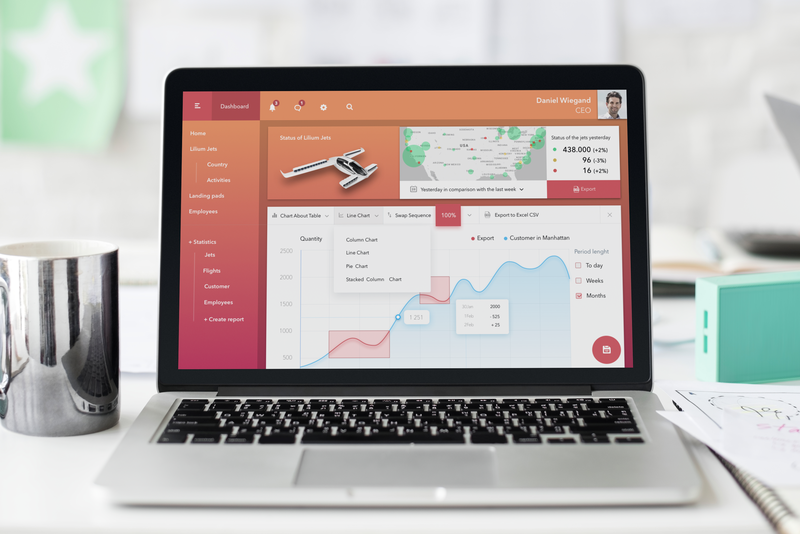 Users include customers and staff alike and each of them has location-specific rights assigned to them according to their role. These are varied and range from unlocking the jet to editing data. Operational plans and tasks must be transmitted and coordinated digitally. Again, the plans are again subject to temporary rights. Since a large proportion of staff is used decentralised and the tasks are distributed and assessed individually, this can be done by algorithms. Tasks are often object-oriented, and because the route of an on-demand jet is unpredictable, they must be flexibly reassigned, depending on their current location. Each aircraft must be configured and maintained in the system. Old jets require regular software updates. This and much more should be provided by a platform. This allows for the right conclusions and is therefore an essential part of the platform. This requires meaningful data visualizations, which, for instance, show user behavior and potential for improvement by applying filters. This is a valuable tool, especially for decision-makers, to drive the advancement of jets and their related services. The more needs of customers and employees Lilium manages to meet, the more effective the market entry will be. For this, Lilium has to adapt the mindset of a mobility service provider. Travel by air taxi usually takes place in combination with other means of transport, therefore the mobility service must be considered holistically. For any user scenario, an effective solution must be provided.